A fantastic blended malt from William Grant and Sons. This whisky has absolutely exploded in popularity in recent years. Monkey Shoulder is named after the injury that often affected maltmen as they turned the grain on the malting floors – a very specific industry hazard! This whisky is produced using spirit from three of William Grant’s distilleries: the illustrious Glenfiddich, Kininvie, and Balvenie. This could well be the best pedigree of contents for any blended malt in history. 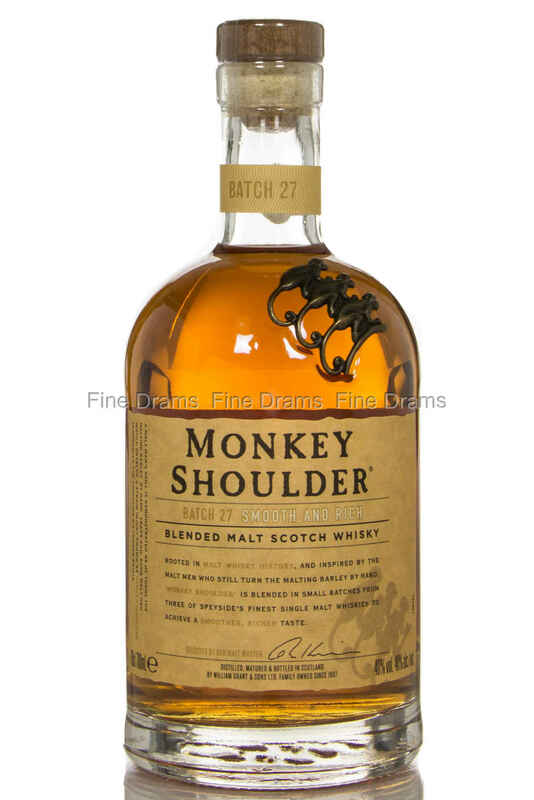 It is understandable, therefore, that Monkey Shoulder considers itself a “triple malt”. This is a perfectly balanced blended malt, with notes of clear heather honey, citrus rind, milk chocolate, crème brûlee, toasted malt, slight raspberry and dried apricot. An absolute workhorse of a blended malt, this is delicious drunk neat, over ice and in all manner of whisky cocktails. We particularly enjoy it in a Rob Roy. Winner of a string of awards.